I'm hoping for a few good suggestions on a Knight T-60 transmitter I'm repairing. It's working well enough with two replacement power supply electrolytics installed that I was able to get about 30 watts out, crystal controlled, on 40 meters. There is a problem in the area of the 6HF8 multiplier tube output circuit, however. Something is far enough off nominal values that the output peaks with the Drive Tune cap at full unmesh. I know that can't be right. I'd really expect the normal setting to be somewhere near half mesh. So far I have only tried the radio on 40m. BTW I hear this old novice Tx can do maybe 50 watts out on a fresh set of tubes. Scroll down the page a little. Look on pdf page 32 (manual page 30). I haven't yet had the time to sit down and really go over the wiring. This being a kit, it's certainly possible it was miswired by the original builder. I need to get that done- I just made copies of all the documentation last night. My one immediate hunch is that maybe the short length of shielded wire might have greatly increased in capacitance over the years? This is the wire that connects between the multiplier C/L matching network and the final amp grid. I see only a 10pF cap C10 across the grid of the 6DQ6B. That's not much, so perhaps aging shielded cable 'delta C' might be the problem? Anyway, any of you guys care to toss out your own hunches as to what to look for here? My main hunch is 'wiring error', however. So far I have found and corrected where one of the pins of V1, the 6HF8 osc/mult, was not soldered, as well as the ground end of a disc cap connected to that pin. Doesn't seem likely but I couldn't rule it out completely. What crystal frequency did you use? Are you sure the bandswitch has been wired correctly at the driver stage? Did you replace C6, 7 and 8? Is your B+ normal at transmit? No, I'm not sure the switch wiring is right. I will wring it out the next couple of days, now that I have a copy of all the info in the manual. Well, I'm sure of this much- the correct inductors are at the right places between the bandswitch wafers. You can tell because they are single layer solenoidal types, and you can see how many turns are on each phenolic form. I used a 7010KHz crystal. There is good indication that the 30 watts I measured is mainly on 40m. Very loud in my receiver with very little at the antenna jack. Of course there could be harmonic energy in excess. The note sounds pretty good when keying. I will try a bandpass filter next and see if the power is similar following that. Wish I had a spectrum analyzer. Yes, of course the bandswitch is set right, for 40 meters. But OTOH I will have to verify the switch wiring next. BTW the settings of the Plate Tuning and the Loading caps in the pi-net look normal for 40m. Only the Driver trimmer is 'wrong'. Last edited by Clutter on Dec Fri 09, 2011 4:45 pm, edited 1 time in total. I replaced C6 and C7, I believe. I'm not near the schematic right now. Anyway, they are the two 40uF/350V ones in the FW voltage doubler. The old ones didn't survive my attempt at slow reforming. OTOH the 20uF/600V cap is holding up so far. I'll replace it as soon as I get one of that value. Once I replaced those two caps, I have seen what I consider to be a normal B+. I get around 540V, no load. About 515 V in CW position. Down into the high 400V range, key down. It's all normal IMO. Have not yet looked at the PS waveform. I'll do that soon. frequency and then maybe one or two more at the higher xtal frequency multiples. I'd check to be sure that you are peaking on the correct frequency. According to the manual, this system is a nominal 60 watts input transmitter. Even at 60% efficiency, you shouldn't expect to get more than 36 watts out. The 30 is probably about right. Looking at the circuit schematic, the driver tune coils are not adjustable. You many have some odd modes going on in that crystal that's causing the tuning to appear to be off. If possible, try another crystal. An 80 meter crystal will work fine. The driver will double it to the second harmonic. If you have a scope you might want to sample a bit of the driver oscillator signal through a small value cap to see if you have a pure signwave or distortions that reflect harmonic energy. These MOPAs are always fun to play with. "The Best Music Ever Made"
Well, I saw no peak whatever. Looked carefully. It 'peaks' all right, but only at the absolute minimum setting on the Drive Tune control. In fact, I see no output whatever at any setting other than the capacitor being fully unmeshed. I wouldn't call that a 'peak' since the trimmer cap is at one extreme of its tuning range. Last edited by Clutter on Dec Sat 10, 2011 9:32 am, edited 1 time in total. Good suggestion. Yes, I have an old Heath grid dipper, and will be trying that. I've made some progress in wringing out the wiring against the schematic, but I really do need to do that more thoroughly. This radio has been through multiple owners, I would guess. I see a lot of rewiring, though not really anything in the way of mods. Best way (usually) to do this is with a spare schematic copy and a yellow highlighter pen. Whoever rewired this radio took liberties, rerouted numerous wires different than the original construction narrative and pictorials in the Knight instructions. Horrible solder workmanship. This makes the effort go a lot slower. Overall impression- the radio had issues due to wiring errors by the original owner/ builder. Subsequent owners tried to 'shotgun' it with component substitutions. There are a number of non-original components in the radio. More solder rework ahead in this project. Last edited by Clutter on Dec Sat 10, 2011 9:25 am, edited 1 time in total. I'd never thought of that. Yes, I suppose that crystal might be running at an overtone perhaps? I'm a little skeptical of that, however. Yes, obviously I should find a few more of my crystals and try them all. I cleaned up the workshop a while back. When you clean, things tend to go missing. Yesterday I did some extensive cleaning up at the band switch. All the solder joints for these little inductors were just horrible. Crystaline joints that looked more 'ladled on' than melted. PVC wire insulation intruding into the solder joints. At one point, a wire that was actually 'mobile'- it could be moved within the solder blob. We'll see if that helped. Grid dipping while working the bandswitch and the Drive Tune ought to tell me a lot. Yes, I have a Tek 465B scope. I'll take a look at the oscillator and multiplier waveforms. Later I can cobble together a pickoff box to look at the final output. I have a Heath HM-2140 wattmeter in series with the dummy load. On the 200W scale, it indicated ~28 watts out. My accuracy is probably about 5-10 percent, however. Yeah, your 36 watts estimate is believable. I had an interesting morning with this radio. Looks like the solder rework on the bandswitch and the driver tuning inductors paid off. I was able to get dips on the grid dip meter on all bands, 80 through 10 meters. I also saw dips on all 5 bands in the PA tank. I recorded all the readings for a rough tuneup guideline later on. No wiring errors were found so far around the bandswitch. It was rather some very rough soldering that seems to have caused problems. Took me several hours to rework that one section. I also saw some evidence of instability on 40 meters as I tried to peak the Drive Tune trimmer. That cap now seems to peak up, for the first time ever, at around a setting of 1 (mostly unmeshed). It's funny- that peak has a sort of 'snap' with some very definite hysteresis on the output power level indicated. It reminds me a lot of how a grid dipper snaps if it's overcoupled. The same except that the dipper shows a frequency hysteresis. This snap around the Drive Tune setting is also audible in my receiver on 40 meters as a change in level that is very obvious, and also a slight pulling of the oscillator frequency, as I recall. BTW my monitor receiver in the shop right now is a KK7B 'microR2' direct conversion design, no S-meter. I like W9ZT's VR tube mod. He added an OA2 across the oscillator plate and eliminated a slight 'whoop' he had on his radio, also he improved oscillator short term drift with the mod. The note on mine sounds pretty good right now, can't really hear much chirp, if any. I think I will add this anyway. "Well isn't that special." Another interesting morning with the T-60. The fuzzy scope photo below shows what I found, regarding the instability I've been suspecting. I'd appreciate any comments as to where to look further. I'm guessing that, due to poor solder workmanship or wiring errors, perhaps some bypass cap shown on the schematic may not actually be in-circuit. Please excuse my poor photography. You're rooking at my Tek scope with timebase set to 5us/div. What did they used to call this sort of thing- was it 'squegging'? Anyway, you're looking at a roughly 200KHz oscillation modulating the 7MHz envelope. If you detune the Drive Tune cap, the oscillation disappears and the output is lower, but at least 'clean'. Actually the sinusoid I saw with the LF not there was not all that pretty. If you adjust the timebase for .05us/div, you get about 2.8 divisions per cycle, so that part looks to be 7MHz, close enough. BTW my takeoff point is at the junction of R23/24/25 with the Meter Sensitivity switch grounding R24. The scope input and triggering are AC coupled. So that's a voltage divider with 3.3K in series with 100 ohms. Using a 10x probe, I think the vertical sensitivity was 5V/div. If you scale up the ~13Vp-p by 34, the divider ratio, you get 442V, pretty close to the no load supply voltage. Comments? Meck is a new one by me. And a T-60, yet. Well, fortunately this radio did not have many tubular type caps in it. They used a lot of ceramic disks. I think the main problem is poor soldering, and also many too many hands under the chassis. I'll keep working at it. Probably some more solder rework in the osc/mult and PA areas will pay off now. This morning degenerated into a basement tidying effort and I didn't get any more done on the radio. I'm overrun with all sorts of parts and hardware, wire and cable, old and new projects, etc. The shop lives up to my Clutter ID for sure. But OTOH being a notorious string saver means I have most or all of the parts I need in stock when I go to build or repair something. I still cant find the rest of my 80 and 40m FT-243 crystals. That was part of why I cleaned up. I hid 'em real good last time. P.S. I've been soldering with tin/lead solder for many years now. That's pretty much all I have in my inventory, anyway. You can get some really good hamfest buys on 5 pound rolls of solder, from time to time. I've scored a few. They're always tin/lead. I'm not against non lead solder. It has its plusses and minuses. But it's just easier to stick with the old alloy. Turns out you can also get squegging if you put too much capacitance directly across a gas tube voltage regulator such as the OA2. The standard limit is said to be around 0.1uF. I'll be mindful of that when I do that W9ZT mod later. Edit: The bathtub cap test did not kill the LF oscillation. It did change the B+ readings. With bathtub caps, 8uF: 526V Standby, 500V CW. I guess that old electrolytic must be pretty marginal. C29 might be open? Or else very high ESR? Or maybe nothing more than the effect of the added loading from the bleeder resistors across the bathtub caps- seems more likely. Now my interest is focused more on the oscillator/ multiplier stage. Something is far enough off nominal values that the output peaks with the Drive Tune cap at full unmesh. I know that can't be right. I'd really expect the normal setting to be somewhere near half mesh. So far I have only tried the radio on 40m. BTW I hear this old novice Tx can do maybe 50 watts out on a fresh set of tubes. I've worked on a number of these transmitters and they all have this issue. I'm not sure what was going on at Knight when they came up with this set up. The solution is to put a capacitor in series with the grid tuning capacitor to reduce the overall capacitance. I don't remember what value I used, but I imagine around 25 pF is a good starting place. Expect about 35 watts output on 80 thru 15 meters, about 25 watts output on 10 meters and forget about 6 meters. This makes a heck of a lot of sense. I recorded Drive Tune Settings vs. band for 80 through 10m. They were 3, 1, 3, 1.5, 2 respectively, and thats on a dial marked from 0 to 10. So that says- measure C30 full mesh and insert a series cap about equal to that. I'll do it. Great suggestion! I've tried one more thing so far. C11, the cathode bypass on the 6DQ6B final, was a huge 600V brown mylar tubular cap. The radio originally had a .05uF disk there. I came up with a tiny .047uF 250V box type polyester and put that in. 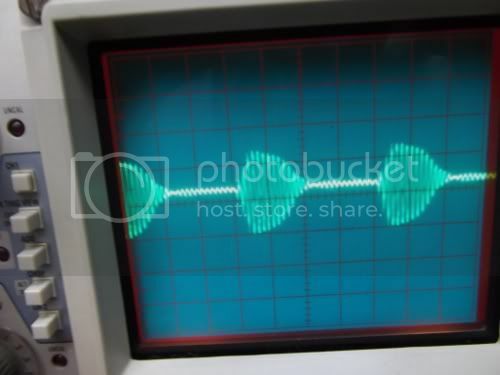 The squegging waveform became much more symmetrical (refer to the previous waveform above). 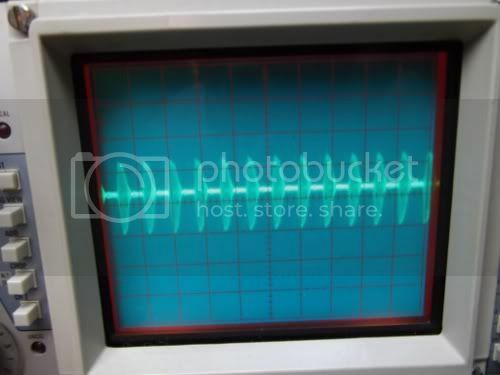 The first photo shows the waveform with the same 5us/div as before, the second shows it blown up at 1us/div. A noticeable change, so I haven't ruled out the LF oscillator being the PA just yet. This is key down BTW, not a keying waveform. But it looks a little like one. Hilarious! Based on this second waveform, it looks like the LF oscillation is actually a little closer to 250KHz than 200KHz. Comparing the first waveform in this set with the previously shown waveform above, I'd even say it looks like this capacitor change might have moved the LF up just a little. 12 pulses on screen previously, 13 visible in this set. I'm not sure, though. Last edited by Clutter on Dec Mon 12, 2011 5:59 pm, edited 1 time in total.